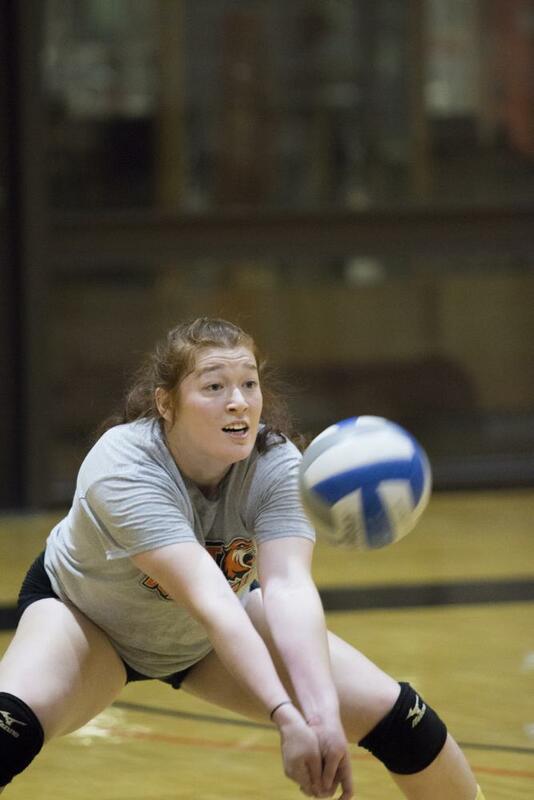 Abby Higgins practices ‘bumping’ the ball at Clark Gym on Sept. 17, 2015. Photograph by Ramya Shankar. 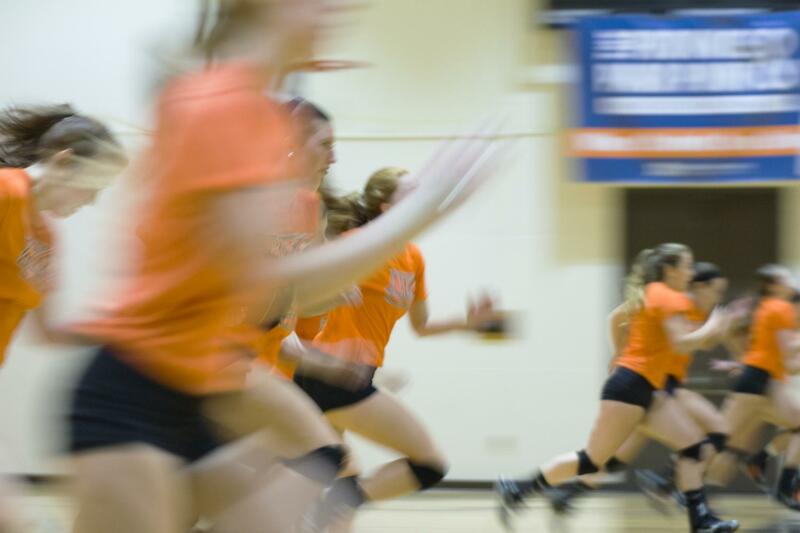 The team runs across the gymnasium during practice at the Clark Gym on Sept. 14, 2015. Photograph by Ramya Shankar. 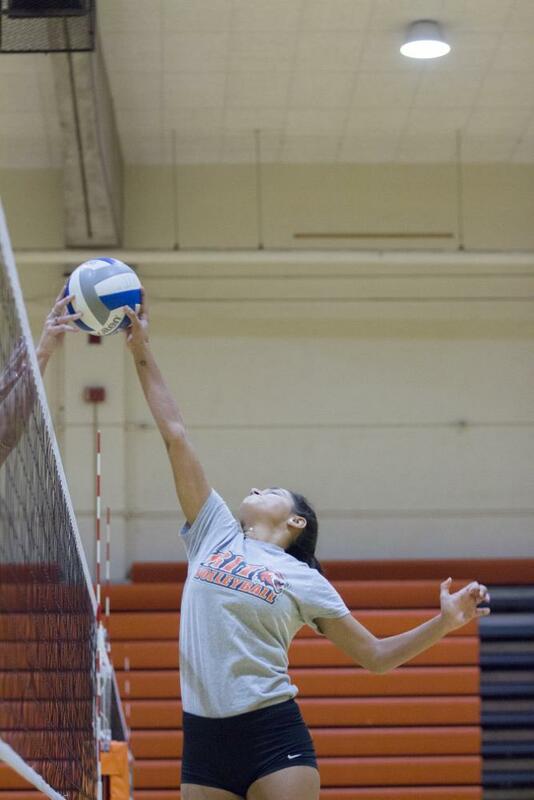 Lais Novaes spikes the ball during practice at Clark Gym on Sept. 17, 2015. Photograph by Ramya Shankar. This past weekend our very own women’s volleyball team played their first home matches of the 2015-16 school year. The team is just coming off a spectacular season last year, with 22 wins and a second place finish in the Liberty League Championships. The Tigers faced off against Alfred State and St. John Fisher at home on Friday, September 18, triumphing over both teams 3-0 and 3-1, respectively. The following night, the Tigers split matches between Oneonta State and Buffalo State, falling to Oneonta State 3-2 and beating Buffalo State 3-0. Head coach Jim Lodes is optimistic that the team can carry over their initial successes into the rest of the season. “We need to continue building on the things that worked well last year,” Lodes said, “Obviously, we have some players that [won't] be returning.  However, we still have some incredible depth this season that I am really excited about”. However, that very same depth is a bit of a catch-22, Lodes went on to add. “We’ve got a senior class that is extremely strong – they make up the main backbone of the team,” he said. “I am also really happy with our freshman – all of them have the potential to contribute greatly, and are quickly learning how to adjust to the speed of college play. When you have lots of depth, it is sometimes hard to build up continuity, because it would be a shame not to use all of your strong players, but then they don’t get as comfortable with each other as when you just have a strong core." The team will also now have to wrestle with the heightened expectations that follow a successful season such as last year's. “There is now an expectation to play that well all the time – and the players really need to face that,” said Lodes. As the lowest-seeded team still left in the 2014 Liberty League playoffs, the team had to prove their legitimacy by upsetting St. Lawrence, thereby gaining a spot in the finals. Now, after making it that far last year and just falling short, The Tigers are hungry for more. Luckily, the team still has the leadership of junior outside hitter Sarah Szybist, who led all of Division III with 709 kills her sophomore season. Hopefully Szybist’s prowess at the net, when coupled with the guidance of five incredibly talented seniors, will help the Tigers not only accomplish their goals, but also set new ones for next year. Regardless, after this past weekend's games, it seems that the Tigers are off to a fantastic start of the season. Let's just hope they can keep it up!